Sometimes, I need to learn to take my own advice. 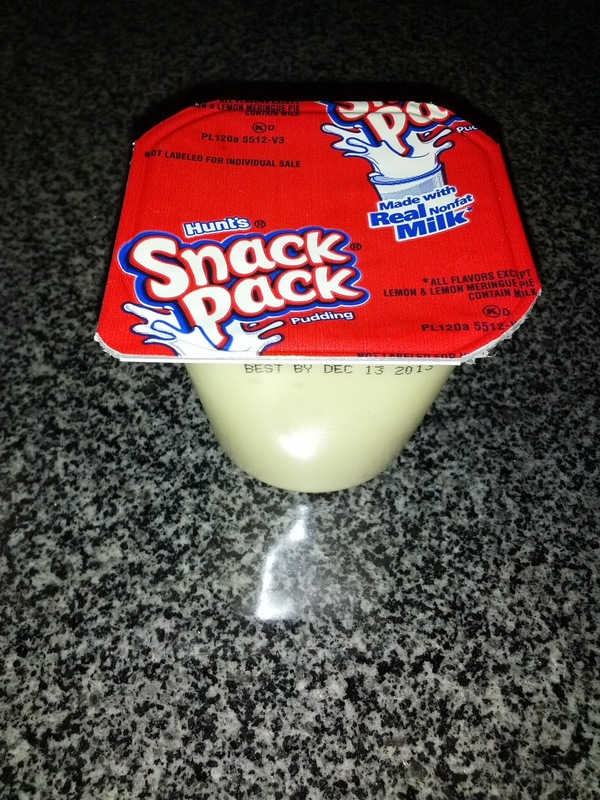 I said snack packs were awful, and that I wouldn't try them ever again. And then, I visited my LA office, where they have a "junk food" microkitchen, and it came stocked with ... Snack Packs! 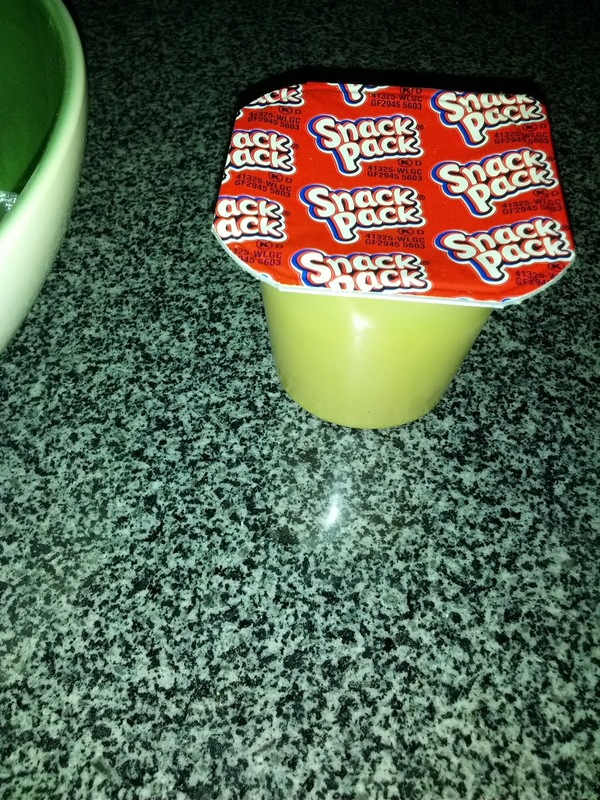 Pudding, I love pudding! I couldn't resist trying another. I know, I know. Why did I try this. Curiosity got the better of me. One bite was all it took to remind me why I don't like these. Plastic. All you taste is plastic. 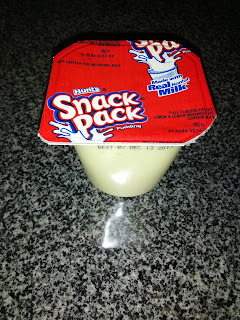 Not chocolate, not creamy pudding, just, plastic. They smell like plastic, they taste like plastic. Dear self: really, don't try these again. 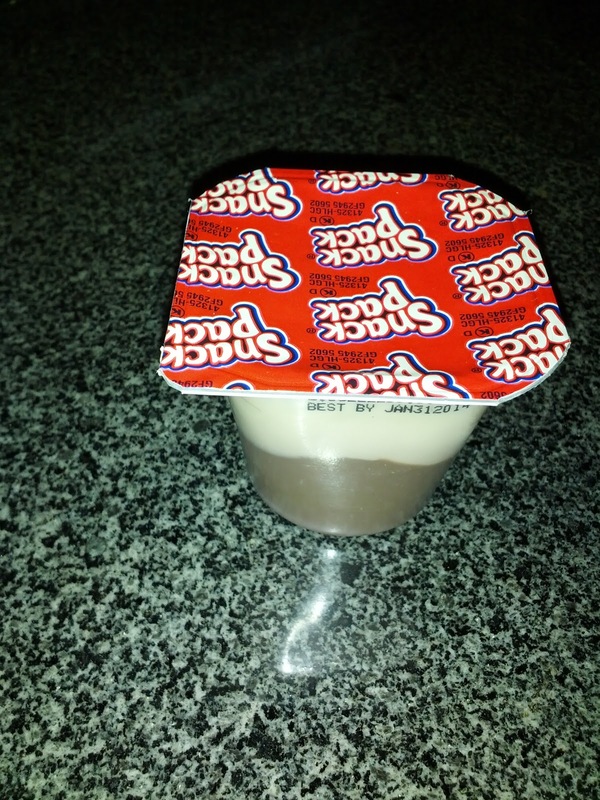 I love pudding. Creamy pudding, rice pudding, warm pudding, cold pudding, I love it all. 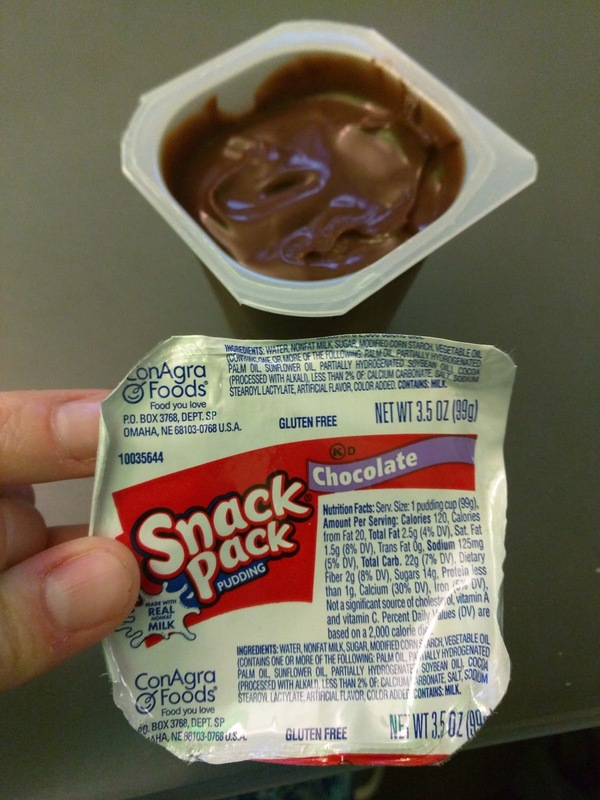 I don't normally go for packaged puddings, but I decided to give Snack Packs a try when I saw one named "Chocolate Cupcake". Protip: Do not go grocery shopping when hungry! They are as bad as I expected. I won't by buying more! Part of the newer "Bakery Shop" line, inspired by baked goods. A layered creation, intending to be like the cupcake base and frosting. 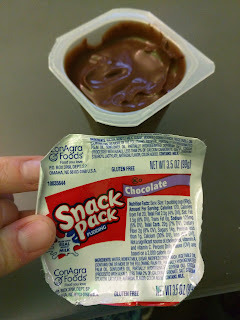 The chocolate layer had ok chocolate flavor, it was slightly creamy, but mostly just kinda tasted like plastic. The top layer, aka, the "frosting", had absolutely no flavor. I didn't get the frosting sense at all. Butterscotch is my favorite pudding of all time, as my grandmother makes a from scratch amazing version. As you can imagine, this didn't nearly live up. 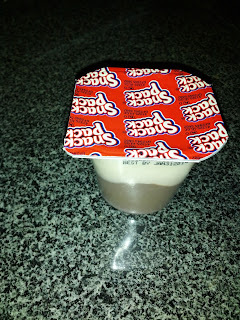 All I could taste was strange sweetness, with the same consistency as the chocolate pudding version that is smooth, but isn't really creamy, and has slightly plastic-like taste. Better than the chocolate cupcake, but still not good. You'd think I'd give up. But ... maybe the tapioca was different enough that it would be ok? Again, not very creamy consistency, tasted like plastic. Sorta vanilla flavored plastic. With a few balls of tapioca, not nearly as many as I'd like. They were flavorless and didn't even really add much texture. Meh. Oh, airport food. Not something anyone looks forward to. I'm sure most of you just grin, bear it, and swing through McDonald's to cure that McDonald's itch that I know we all get. But not me. I can get McDonald's anytime. To me, every airport is an adventure. There might be something ... new! I had a 2 hour layover in O’Hare, and of course, immediately began researching my options, trying to find the best of the lot. The answer was pretty clear: Tortas Frontera. It sounded like people thought it was good, as in, legit good, not just for airport food. Hundreds of reviews, and 4.5 stars on Yelp? Even regular restaurants don’t normally get those sort of accolades. 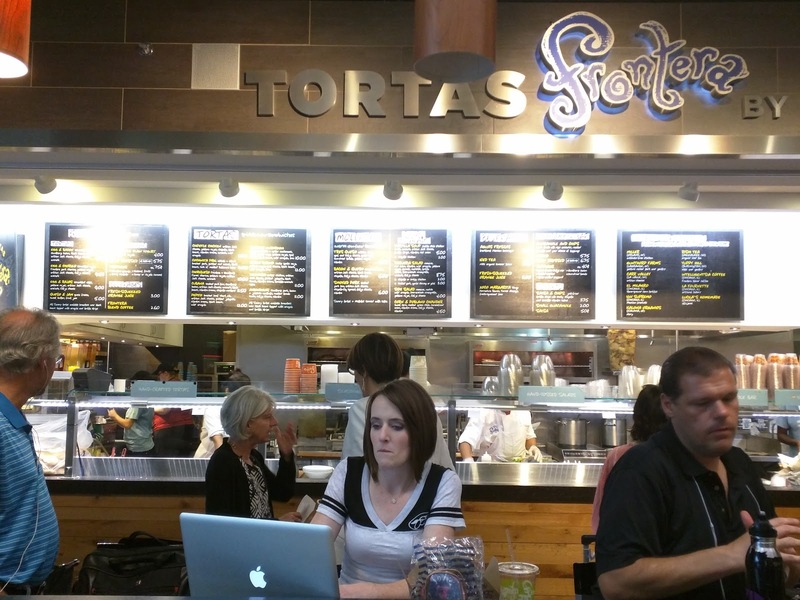 Tortas Frontera is one of Rick Bayless’s places. 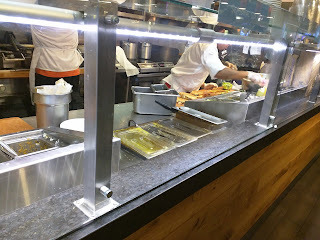 I’ve tried a few bites at the Frontera Grill in a food court in San Francisco, and was impressed there by the flavors (sadly, it was shuttered), so, this certainly had potential. 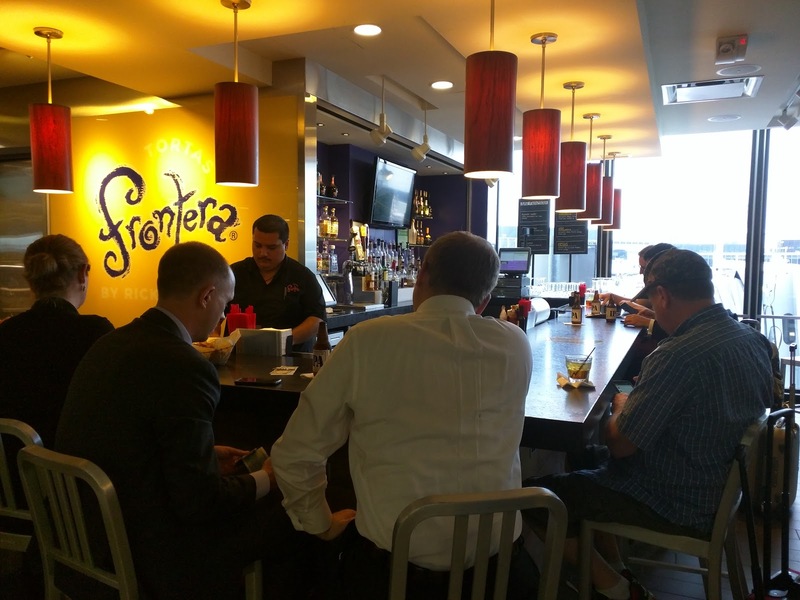 At Tortas Frontera, even in the airport, nearly everything is made fresh to order. They pride themselves in their ingredient sourcing. The menu has a large section devoted to where the food comes from, ranging from the Miller antibiotic-free chicken from Orland, IN, to bread from local La Fournette bakery in Chicago, to even a special coffee blend made by Intelligentsia. Serious quality sourcing. The establishment is located in a big food court, alongside McDonald’s, generic looking pizza, and all the usual suspects. 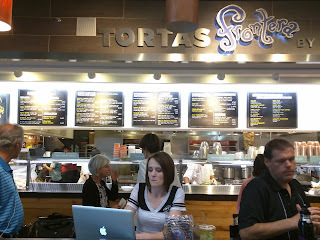 The food court shares seating in the middle, but Tortas Frontera has private seating in addition. Not much, just a long thin counter with a rail separating it from the walkway, but, it is something. There is also a bar on the side, which was constantly active, with bartenders whipping up some pretty tasty looking margaritas. So far so good. The menu mostly features tortas, as you might expect given the name. If you are into sandwiches, they seemed to have something for everyone, meat lovers and vegetarians alike. For those who want to load up on meat, the cubano is filled with smoked pork loin and bacon, or you can opt for the pepito with braised beef short ribs, the chochinita ibile with braised pork, the choriqueso with chorizo, or albondigas (pork and bacon meatballs). Prefer poultry or seafood? Several options exist for you too. Vegetarian? No problem, the roasted mushroom version gets rave reviews. All tortas come with assorted flavorful sauces and other filling components as well. If you don't want a torta, you can go for a salad, or have any torta made into a salad. Tortilla soup, corn & poblano chowder, and a host of chips and salads and guac options round out the menu. The other main choice is molletes, open faced pizza/flatbread sorta things. Tortas Frontera also offers a breakfast menu with scrambled egg tortas and a greek yogurt bar, but I visited in the evening. 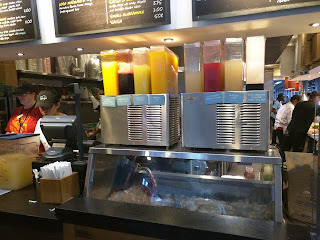 For non-alcoholic drinks, they have a slew of house made aqua frecas, pictured above. Everything as made to order, as promised. Not typical fast food. 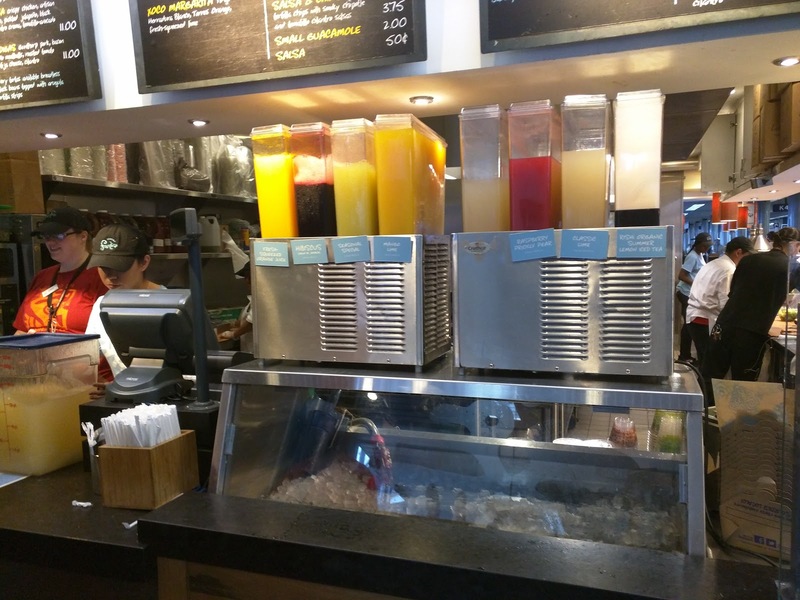 Every station was frantic, busy, churning out orders at a rapid pace. And yes, each and every salad was hand tossed with dressing to order. No soggy lettuce here. Each sandwich assembled and grilled to order. I can't even count how many fresh avocados I saw chopped up during my brief time there. The only thing not made to order is the molletes (open faced flatbread/pizza like creations), which are also the only items that garner lackluster reviews. The model is order-at-the-register (except for bar seating), get a buzzer, and wait. When I ordered, I was warned that it would be 10 minutes, which I already expected. The wait time estimate was dead on, my buzzer ran in precisely 10 minutes. All orders are packaged to go. 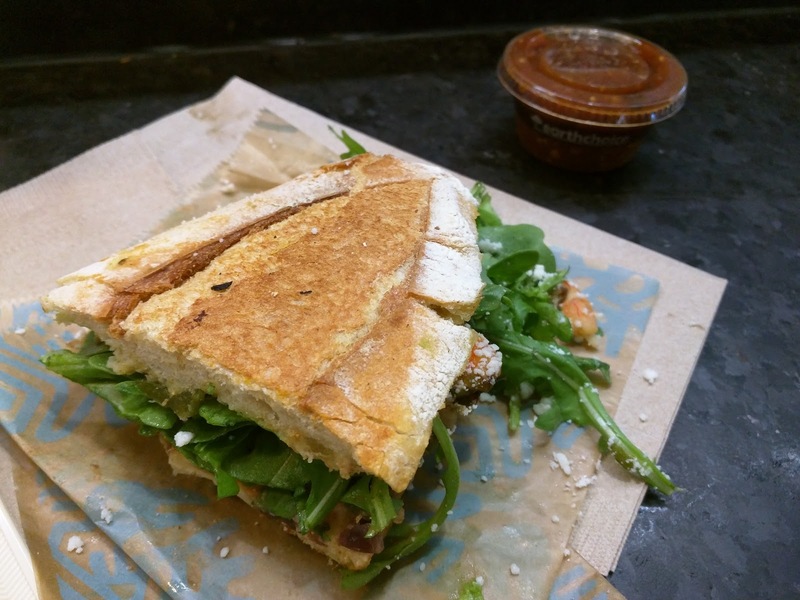 "Smoky garlic mojo, poblano rajas, goat cheese, black beans, wild arugula, lime." I wanted something a bit lighter than the heavy meaty options, given that I was mid transit, and didn’t really want to over indulge and feel nasty on my next flight. Plus, I had my eye on the TCBY nearby for an after-dinner treat. I oped for the garlic shrimp torta. Since I don’t like goat cheese, I subbed that out for cojita, which I knew they offered since other tortas used it. It was no problem to make the switch. The sandwich was nicely grilled, very crispy on the outside. Inside was a smear of a black bean spread, and a generous layer of grilled poblanos. There was plenty of arugula, which made it feel light, exactly what I was going for. The arugula was really spicy though, in a peppery way, that I didn’t quite care for. As for the shrimp, again, a generous amount. They were … decent. Not too rubbery. I didn’t taste the garlic though. I never found any “lime” in it either. The smokey garlic mojo was provided on the side. It was nicely spicy, but I actually expected this to be more of a creamy component, which I really wanted. My sandwich needed some fat! I wanted aioli! Overall, it was … fine. Ojan really enjoyed it. But I guess I just wasn’t really in the mood for it, and really, my decision to go for something light backfired. At the end of the day, when am I ever happy without mayo, cheese, or cream, anyway? And, oh yeah, I don't like sandwiches. But if you do like sandwiches, then trust Ojan on this one. He really did enjoy it.